Former All Black wing Julian Savea and Springbok flank Jacques Potgieter are reportedly on the Southern Kings' wish list. The report added that the Kings and Savea’s representatives have been locked in talks during the past few days. But with the former All Black ear ning about R23 million per year in France, the Kings would need to exceed or at least match his salary. That is not even remotely meeting the SARU guidelines on quota selections. In the meantime the SA Institute of Race Relations had a countrywide within the sportsperson and supporters and there results showed that 83% of the people oppose the quota selections and amongst Blacks alone the finding is that 82% is againt the quota system. I predicted this last week that Toulon would use the Kings as a dumping ground to dispose their rejects. haha you are spot on mike. only 3 wit okes in the starting XV and 1 on the bench. now they try and recruit an all black? savea is a more than decet reject. He is a has been. He is not even SuperRugby standard anymore. He is slow. You have to credit how the all Blacks manage their players. The year before he was dropped he was on fire. But they clearly had an expectation of him of where he needs to be if he wants to hang onto his jumper. Subsequently they send him to the bush leagues but couldn't claw back his way. If that was one of players, of colour we would have hanged on to them. Look how long we held on to JP Pietersen. He played for 3 years too long in the bok jersey. But the upshot for Savea was that the big French team was happy to dole out the cash to get him. Whereas if they hung onto him his value would have plummeted. So even though the French bought a lemon. Savea was still able to build up a nice little nest egg. He should be able to live a comfortable life. Frogs are probably healthy and almost pure protein - which is impossible to put weight on from. Savea spends most of his spare time at KFC. He is lazy, and his commitment has been questioned even when he was in his prime. Frans Steyn hasn't been fat for some time. Thanks for the frog lesson - I am thinking of opening a KFC in PE just for the benefit of dear Julian - maybe one should add another special brand to cater for Fat Fransie of he joins Julian in a combined attack on the food supply chain in the Easter Cape. .
SharkShit, your stupidity is showing itself again. Chicken is an excellent source of protein ... on it's own ... but when crumbed and deep fried in oil it becomes a heart stopper. 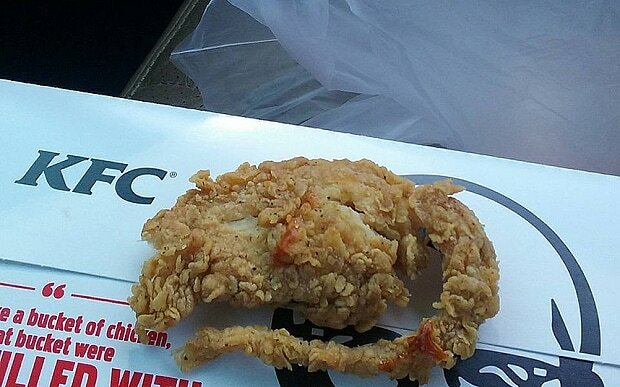 Frog legs would go the same way if it were prepared in the same way. Is there anything out there that you can actually debate on without making a tottie of yourself? @Clean Cut, Aka the lost sheep. Chicken is 70% protein, and turkey is 90% protein - so poultry, in general, is healthy. However, anything that is made by Mcdonald's is a heart attack in the making. You are just reiterating what I have said, and trying to sound clever while doing so. Stick to interpreting scripture and Noah's Ark.. Your pals the Jihad's also believe in the Noah's Ark. Maybe you all shared the same boat. Although surely an extra few baboon's would be better than any of you.